But for the purpose of grant proposals (and subsequent grant reports), you have to describe a nonprofit’s intentions for a project in terms of goals and objectives, and the objectives must logically lead to achievement of the goals. Many of us have heard that goals and objectives need to be SMART (specific, measurable, attainable, realistic and time-bound), but it can be tough to write comprehensive goals and objectives from scratch. Step 1) Fill in the blanks in this chart. Step 2) Combine the what-who-how much-by when statements that you wrote in the chart into objectives. If you used this chart to develop goals and objectives for a grant proposal to fund a project about working with immigrants to develop their capacity to be successful farmers, here’s what your chart and subsequent objectives might look like. 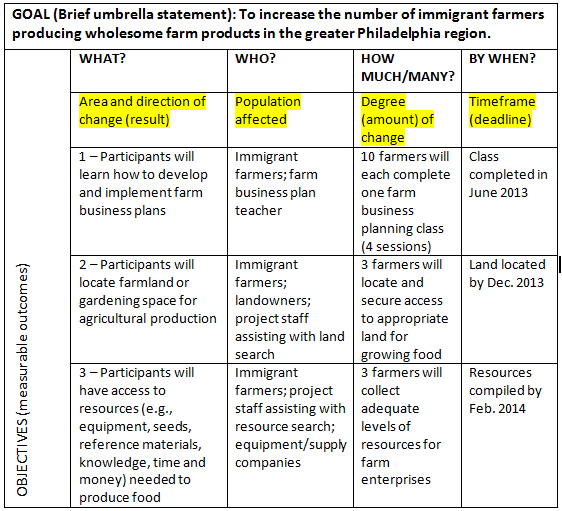 Objective 1: By June 2013, ten project participants (immigrants who aspire to be farmers in the Philadelphia region) will each complete all four sessions of a farm business planning class. Objective 2: By Dec. 2013, three project participants will locate and secure access to appropriate land for growing food (farm or garden plots), with the active assistance of project staff. Objective 3: By Feb. 2014, three project participants will have collected adequate levels of resources (e.g., equipment, seeds, reference materials, knowledge, time and money) to launch their farm enterprises, with the active assistance of project staff. Using this chart, you end up with measurable, tangible and realistic objectives! Yay! To learn more, check out this excellent article by Joanne Fritz on how to write goals and objectives. There are a lot of good books on grant proposal writing out there, but these three are among the best!